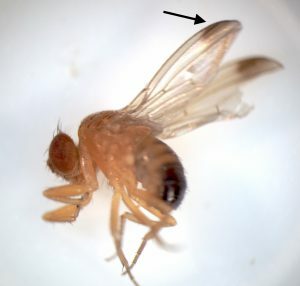 Spotted wing drosophila (SWD) are small fruit flies that resemble the flies commonly seen indoors buzzing around rotting fruit. Adult male SWD have a little spot on each of their wings, making them easy to identify. Females are more difficult to identify. At the rear of the female SWD abdomen is an egg-laying structure called an ovipositor. The ovipositor is serrated, like a knife blade, and can actually cut into ripening fruit, so the fruit doesn’t have to be rotting. This is a problem because SWD can lay eggs in ripening fruit that consumers want. SWD can attack most berry fruit. This pest has also been known to get into ripe peaches and cherries. In addition, SWD will attack wild hosts such as gooseberries and mulberries. This is a challenge for growers because they can spray for SWD on their crops, but the pests still may be reproducing in unsprayed wild hosts nearby. According to Brett Blaauw, assistant professor and Extension specialist in entomology at the University of Georgia, the biggest concern for grapes is that SWD can also transmit plant diseases. The flies can carry bacteria, fungi and yeast from one fruit to another. In grapes, SWD can transmit sour rot. Once grapes have sour rot, they are unusable for wine production. Blaauw says grape growers can prevent SWD by using insecticides. “Unfortunately, the life cycle of spotted wing drosophila is really fast,” he says. “It can complete a life cycle within 8 to 10 days when it’s hot. So in the South, this pest is ghastly. You could have several generations within a month. This means growers have to do lots of insecticide applications and rotate those insecticides for resistance management. Once grapes are attractive to SWD, growers can initiate pest management. Rather than spraying all season long, Blaauw suggests to wait until the grape sugars are attractive to the pest. A rotation of pyrethroids or organophosphates works well to manage spotted wing drosophila. “One thing that we’re working on at the University of Georgia is looking at a combination management tactic where we’re doing some cultural control in grapes … We do leaf removal to open up the grape clusters to allow air flow, take away some spotted drosophila habitat, and it also lets us come in with an insecticide and a fungicide to help manage the flies as well as the sour rot,” Blaauw explains.